The rapidly expanding online pharmacy DocMorris will be establishing premises at the Avantis business park. To continue to expand in the future too, the online pharmacy is intending to move into new offices in the first half of 2015. “By opting for Avantis, we are convinced we have found a location that offers us ideal conditions for further growth”, says Olaf Heinrich, CEO of DocMorris. 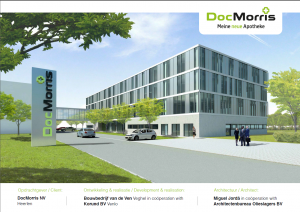 Construction company Van de Ven from Veghel in the Netherlands will be building the four-storey office complex (approx. 5.500 m²) and a distribution centre (approx. 10.000 m²).The total surface area of the site is 30.000 m2. Construction work will start in the spring of 2014.